Shoreditch is still the go to area in London if you want a guaranteed great night out with lots of variety. We’ve spoken with local girl and blogger Stephanie from alexie.co to give us her rundown of the top 5 rooftop bars in Shoreditch. A firm favorite whether in Summer with it’s playful lawn and lush cocktail menu or the super cool wigwam in the winter, this bar has it all. What makes this venue especially good is the uninterrupted views of the city. Not content with an amazing room terrace they also have a cool club in the basement, a heaven on a cold night. Top Tip: The roof terrace closes at 10pm and it becomes paid entry only. Make sure you get there early to enjoy the sun and then free access to the rest of the club. This is easily the coolest of rooftops in the whole of London with the only heated rooftop pool that I know of. The catch being that you either need to be a member or know someone that is. No easy task and don’t try and blag your way in, the reception just won’t have it. But once you’re in sit back and enjoy the stunning views across London. Make sure you get there early to grab a double bed in the Secret Garden for some rays and people watching. Top Tip: call in sick and go during the week, the crowd is cooler and you will get more chance of snagging that deluxe bed. Also for a lunchtime nibble you have to try their pizza’s, they are THE best! Not the most obvious choice as it is tucked away down a side street and with a strict door policy so make sure you get on the guest list. Great for watching the chaos below on commercial road as you sip an ice cold mojito. 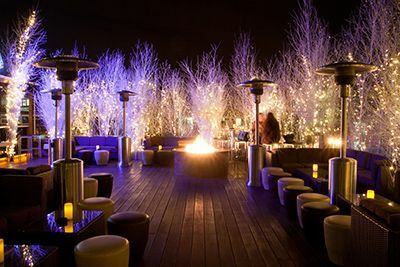 One of the larger roof top bars so plenty of space to find somewhere to sit and enjoy the night with friends. Top Tip: make sure to go on a warm night or take a good coat as it backs onto a tall building which obscures the sun after 5pm. This rather swanky venue is just a stroll from Liverpool street and has one of the best views of London. Located on the 42nd floor you can just rock up and go for a drink but it can get busy so if you can arrive early. A very glam crowd go here so make sure you dress to impress. Top Tip: Go all out and enjoy dinner with a view. You have to try the wagyu beef, totally delicious and worth the steep price! A new arrival on the Shoreditch Scene and a great addition. This converted police station has bags of character and an amazing view back into the city. The bar has all bases covered with a great cocktail menu so make sure this is on your list. Top Tip: hit up the barman for whiskey sour, they are amazing!